A new product I have been working on – Lighten Up Herbal Skin Lightener – has generated some questions about skin lightening ingredients – both what I am using as well as the ones commonly found in commercial products. There's a bit to cover, so here is the beginning of a new mini-series: all about skin lightening ingredients (and some of the unexpected bonuses they offer). 2. I simultaneously received requests for a skin lightening product from 2 ladies who both agreed to be case studies (see links below). The skin lightening formula I developed for these ladies uses a cocktail of different plant-based active ingredients. Today it's all about the main active – the big kahuna – the amazing vitamin C.
You can thank your mom now if she was constantly feeding you vitamin-C rich foods throughout your childhood. Vitamin C is essential for the formation of collagen (the main fibers that make up the connective tissue in skin). This vital vitamin functions as an antioxidant and free radical scavenger. Some animals can produce their own C-vitamin, but we humans need to add it to our systems from external sources. Perhaps you've heard vitamin C described as L-ascorbic acid. You would be right. 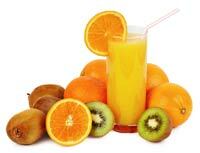 This is what you get from fresh squeezed oranges, fresh strawberries, fresh kiwi or other vitamin-C rich foods. They're full of all the antioxidant and free radical scavenging goodness you could wish for – until shortly after being squeezed or mushed up when the vitamin C degrades, oxidizes and looses its power (an excellent reason to drink fresh-squeezed orange juice immediately after it has been prepared). The challenge of capturing the actives of vitamin C and giving them the necessary staying power for use in different skin care products has had many a scientist scratching their heads for years. But now, they've done it. What they've captured is a vitamin C derivative called Sodium Ascorbyl Phosphate. On application, Sodium Ascorbyl Phosphate splits up after entering the skin and releases active vitamin C right where it can do the most good. It is an effective antioxidant, protecting the cells against damage caused by free radicals. It also promotes collagen formation (making it an ideal anti-aging ingredient). Its rejuvinating properties are excellent, helping to improve the skins overall appearance. Sodium Ascorbyl Phosphate also acts on the melanine formation process to prevent hyperpigmentation. With a larger dosage, it will help to lighten the skin. For skin lightening action, my supplier recommends a max dose of 10%. I followed their instructions and added a full 10% to the first 2 batches, but reduced to 7% in subsequent batches – not because there were any adverse effects to the skin, but because I was having trouble with the texture of the formula. Have you ever tried a skin lightening product (commercial or otherwise)? Did it work for you? Ohh that sounds exciting! Are you using this as a kind of spray on tonic? How long have you been making and using this? I don't know if you've come across it but vit. C in form of SAP has another very nice side effect - a strong antimicrobial effect, especially on this nasty P. acnes. Thanks so much for sharing this info and these links. I am definitely going to be studying these results to be sure! It seems we both have the same challenge with texture of this raw material- it does indeed love a liquid environment.